You … You … You Are Going to Share Your Mango, Aren’t You? Ever since first seeing pikas in the Tetons, I always choose some of my hikes on my Wyoming trips to go into terrain where I might glimpse these little mammals. So it should be no surprise that I chose many of my hikes on my trip to Mount Rainier to put me into the land of marmots and pikas. At first I had only near misses at pictures as pikas scampered along the Sourdough Ridge Trail, dragging plants down into their homes under the rocks. But at the end of my first full day of hiking, the Palisades Lakes Trail blessed me in abundance. I stopped at a talus field near the end of the trail for some water and snacks, hoping that a pika might poke its head out from the rocks while I rested. I had heard but not seen them in the area as I passed by at the start of the hike, but it wasn’t long after I opened my water bottle that this pika first appeared. It was busy adding plants to its cache under the rocks, occasionally stopping to eat a little. I took a number of pictures while it was active, spending almost half an hour watching it as it gathered food. During the stretches where it was out of sight, I swapped the camera for my water bottles. I took me a while to quench my thirst as I picked up the camera any time the pika popped up, but eventually during a quiet stretch I turned my attention to my hunger and brought out my bag of snacks. We had picked up some dried mango slices shortly before I left, I had never tried them before but they immediately became my favorite treat of the trip. As I started into the mango the pika suddenly reappeared, so I closed up the bag and set it a nearby rock before picking up the camera for more pictures. The pika kept ducking in and out of the rocks, classic pika behavior, but I could hardly believe my eyes when I realized that the pika was actually working its way in my direction. The little thing was soon too close for pictures so I just stood baffled by such a close encounter. I soon realized its intention as it shuffled over towards my snack bag and sniffed around. I eased over and took the bag away, having just watched it store away a variety of plant life I feared my dried fruit was about to be added to the cache and enjoyed all winter long by my furry friend. It hung around for a little while, almost at arm’s reach but always with an escape route into the rocks. The timing was probably coincidence, but when I finished the mango it either lost interest in the remaining fruit or realized I wasn’t going to share and headed back up the slope. I finished my snack and hoped for more pictures, but it wasn’t long before the pika went under for good and I continued up the trail. I couldn’t help but feel guilty about not sharing my bounty, given that it posed for so many pictures, but better to keep them wild. Besides I knew from our time together that it wasn’t going to go hungry this winter, even if it was going to have to miss out on the mango. 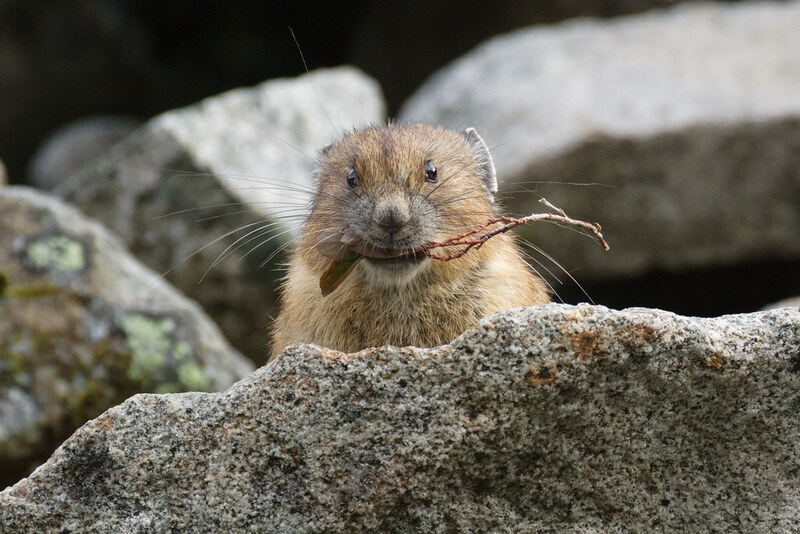 This entry was posted in Mammals and tagged American pika, eating, Mount Rainier National Park, Palisades Lakes Trail, sunrise, talus field, Washington. Bookmark the permalink.